When filming his TV series Race Relations, John Safran spent an uneasy couple of days with one of Mississippi's most notorious white supremacists. A year later, he heard that the man had been murdered - and what was more, the killer was black. 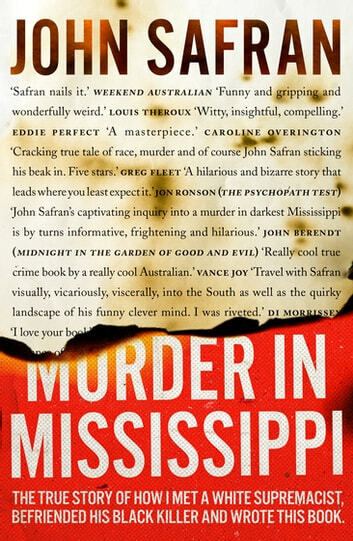 Over six months, Safran got deeper and deeper into the South, becoming entwined in the lives of those connected with the murder - white separatists, black campaigners, lawyers, investigators, neighbours, even the killer himself. And the more he talked with them, the less simple the crime, and the world, seemed. The first True Crime book I have read, a great introduction to the genre. Funny and informative, leaving me unable to put it down. A must read for anyone. John Safran is a uniquely talented documentary maker and he has turned his skills to writing. He manages to see the humanity and ridiculousness of all his subjects, but there seems to be an underlying level of affection for those he comes into contact with. This book manages to deal with institutional racism , classism, homophobia and human complexity. No one in this book including the author comes out as wholly good or bad. Thoroughly enjoyed reading this, interesting characters and a very intriguing story. Thank you John Safran, I will definitely recommend this book to everyone. Couldn't put this book down but couldn't understand why either. . A great 'diary' of chasing the truth in Mississippi.